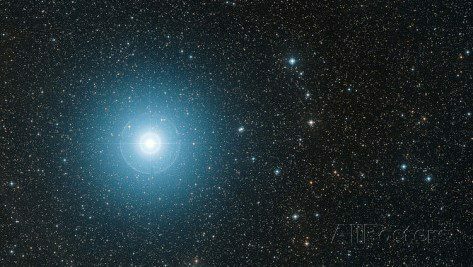 Fixed star Al Hecka, Zeta Tauri, is a 3.0 magnitude bright blue binary star located on the tip of the Southern Horn of constellation Taurus the Bull. The origin of the traditional Arabic name Al Hecka is obscure, but it closely resembles Al Hak’ah which means The White Spot (on the horn tip). In ancient Babylon it was called Shurnarkabti-sha-Shutu, the southern star bull horn. In China Al Hecka is called 天關 (Pinyin), Tiānguān, or Tien Kuan which means Celestial Gate. Fixed star Al Hecka is of the nature of Mars. It gives violence, male violence and danger of accidents. Sometimes called “The Driver”. Al Hecka, ζ Tauri, marks the tip of the bull’s southern horn and, as we might expect for this piece of weaponry, Ptolemy classed it as a Mars star. Tracing the Arabic original of the name is not made easy, early western scholars having generally made a poor job of that language. It may derive from Al Qarn, The Horn, a difficult near-K sound for us to pronounce, but more closely it resembles Al Haikal which can mean either a Huge Beast (such as a bull) or a Temple. To the Chinese it was Tien Gwan, the Heavenly Gate, so the Arabic ‘Temple’ is at least as likely as Huge Beast. One further possible Arabic origin is from Al Hak’ah, the White Spot (on the horn tip). 1. Fixed Stars and Constellations in Astrology, Vivian E. Robson, 1923, p.125. 2. Fixed Stars and Judicial Astrology, George Noonan, 1990, p.34. 3. The Living Stars, Dr. Eric Morse, 1988, p.39. 4. The Fixed Star Health and Behavior Imbalance, Ted George and Barbara Parker, 1985, p.37. Yikes! This is 2′ away from my Gemini Sun at 27′! I have lived a violence free life so far. What does Al Hecka do when it’s conjunct Midheaven and Part of Fortune?